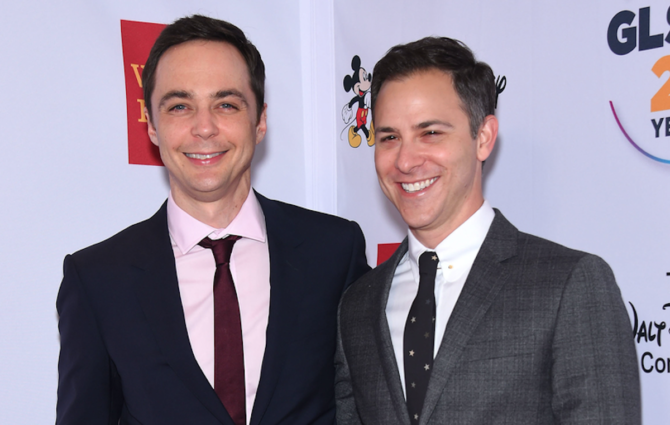 Jim Parsons, who stars in the colossally successful CBS sitcom The Big Bang Theory, is also reportedly to blame (or thank) for the series meeting its end after 12 seasons. He’s had enough, apparently, turning down a massive pay offer to bid farewell to the show. Twelve years is a long time and Parsons was already the highest paid actor on television, so money wasn’t exactly driving his decision. But rather than construct a Scrooge McDuck-style vault and spend his remaining days diving headfirst into gold doubloons (ow), the openly gay actor already has his next big move mapped out. And surprise, surprise! He plans to bring more gay-themed content to the small screen. Parsons and Young & Hungry creator David Holden are developing a multi-cam comedy at NBC called The Inn Crowd. Parsons recently appeared in the Broadway revival of Boys in the Band, alongside an all-gay cast that included Zachary Quinto, Andrew Rannells and Matt Bomer among others. Thank goodness it won’t be on CBS or Fox! Wise man. What network will this sitcom be broadcast from? I didn’t see any one in particular mentioned. I am looking forward to this new show as well! Thanks for the info. I saw him that way for awhile then I changed. Part of it was his transformation from a stick to a more robust looking male. But there is a droll about him that people find attractive and was a bit of a downer for me. I rarely watched the show. I quite like him as a person after seeing him in interviews so I’m hoping this new show will have more of a zip to it. This sounds like a very fun project. Will look forward to its premier. PS intuition says this is going to be a big hit. Yay! Awesome. Sounds like we can plan to see a special guest star or two on the show each episode. To all the people screaming that LGBT actors shouldn’t be cast and complaining about straight actors losing roles to them if they are cast in LGBT parts. Then again, more LGBT themed shows is probably exactly what the troll accounts are afraid would happen. I have watched the Big Bang since it started and find it a well done show. I am an older actor and have watched as these young actors have progressed in their art. I wish Mr Parsons the best of luck with his new series. I only wished there were more roles for older actors to portray.